Delays at Heathrow Airport passport control left passengers queuing for up to two and a half hours last month, figures show. On 30 out of 31 days in July, the border force missed its target of a 45-minute wait or less for 95% of visitors from outside the European Economic Area (EEA). Virgin Atlantic, which obtained the data, said passengers are "frustrated". The government said it is deploying 200 extra staff to Heathrow this summer. 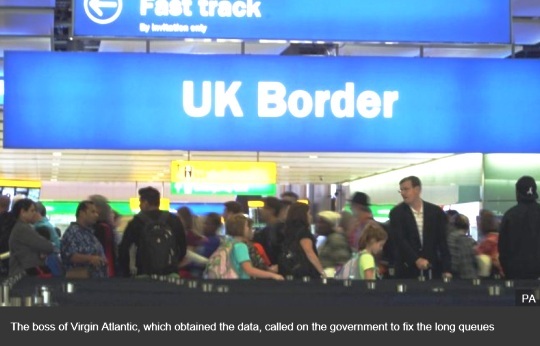 According to the data, the longest immigration queues were on 6 July when travellers from outside the EEA - an area made up of 31 European countries - had to wait in line for up to two hours and 36 minutes. Craig Kreeger, the boss of Virgin Atlantic, said while it is agreed that security and safety is a priority, other countries are managing their borders better than the UK. He said "only the Border Force" can take action to "resolve these unacceptable queue times". "At a time when the UK needs to show the world it is open for business, the government and Border Force need to provide a great first impression for every visitor every time," he said. Citizens of the European Union, the EEA and Switzerland can use the electronic gates at Heathrow's passport control - but visitors from all other countries must have their passports checked by a border force official. John Holland-Kaye, Heathrow's chief executive, has previously called for the Home Office to allow visitors from "low risk countries" - like the US, he suggests - to be allowed to use the electronic gates. Last week the boss of British Airways, Alex Cruz, wrote a letter to the Times urging the government to deal with Heathrow's "border farce". He said "two-hour queues are fast becoming the norm" and Heathrow has missed its target for non-EEA arrivals 6,000 times so far this year.